Happy 10th of February already! I thought it would take ages between one Twofer Card Challenge ending and a new one beginning, but the time whooshed by and here we are again! I do hope you aren't sick of making cards with hearts! This multi-layered card is for a summer wedding of a dear family friend. I don't know yet what their colors are so I went with a shimmery neutral theme. The paper is a beautiful specialty paper. If you click to enlarge, maybe you can see that it is a silky linen shot through with creamy white embossed lines. Too bad there isn't "feel-avision" on our blogs! I filled my design landscape with the gorgeous and intricut NBUS heart. It is an M&C Boutique die that I received quite a while back from my friend Ros. The pattern is roses and butterflies. I kept the bits in place and popped the heart on foam. I tied it to the card with a creamy velvet ribbon to symbolize two souls uniting as one. In case that was too subtle, I added layered sediment dies to let them know they are now together forever! Or forever together! It just occurs to me that when I find out what the wedding colors are, I can replace the ribbon with one of a different color which will make it more personalized without changing my design. Whoop! For my second design, I used pops of color and left a lot of white space by setting the same heart die off the edge of the card. Here you can see the pattern of the die a little better and again I used a pretty linen card base. I like that there are only three elements to the design: the heart, the butterfly, and the sediment. With the help of my MISTI, I could stamp the sediment in colored ink repeatedly for complete coverage. Can you see that the little heart is wearing a bit of gloss? The butterfly was made by running the same heart through the cutter with a piece of pp. I then freed the butterfly to use it to punctuate the message of the sediment. You might notice the bottom wings appear differently on the "freed" butterfly. What happened was I wasn't paying attention and I accidentally cut through the left dealie-bobber on the bottom of the butterfly's wings when I was freeing her from the die-cut. Oops. It seemed only right to amputate the other one for balance purposes. This Valentine card is really a love note. It's the perfect size to slip into the Mister's motorcycle tank bag so he finds it when he goes on a ride tomorrow! 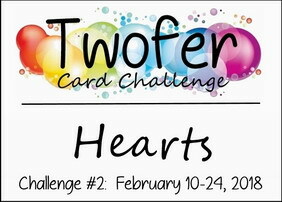 Head over to the Twofer Card Challenge to see the amazing Twofer designs the rest of the Design Team has created for your inspiration! Two beautiful cards. I like the cream on cream (a bit of a twist on w on w) . I like how you used just part of the heart on the second card. This is a great challenge and I hope to join in. Smashing makes ... it has to be said that I don't make a lot of cards with hearts but will see what I can do ..
Two beautiful cards...of course!I love this idea of making two cards...I will get to work on mine and be entering this month for sure. I think my fave of these two is the last one as I so love that beautiful shade of green and the lovely sentiment! Fabulous both Darnell, and so inspiring!! 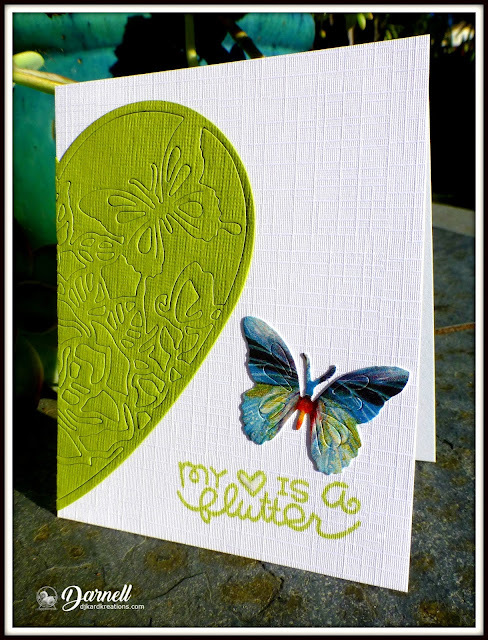 Love especially the second one, great design and that textured butterfly is delightful! Fabulous cards!! I love how you used a part of the one heart, very clever! I will find this heart one more challenging then the feathers lol...only because I have so many heart things I won't know WHAT to choose, where the feathers it was an almost no choice lol!! Wonderful cards, Darnell. So pretty and I especially love that butterfly. Makes me smile! Thank you so much for sharing. :) Hugs! Both are very pretty! I love the linen texture on the second card, so classy! Fantastic cards and like the twofer idea! I love that beautiful green and the heart die is simply gorgeous. The wedding card is a delight with that beautiful paper and textured sentiments. I've heard of clipping your wings but you really did it! Mister will love that you tucked that in for him. I can't wait to get started on this challenge. We are supposed to get freezing rain today and a cold wind is blowing - perfect crafting day. Your shimmery wedding card looks so elegant! Love that amazing card stock! Great idea that you could personalize it with a ribbon in the wedding colors but it looks fantastic all in cream! Oh WOW!! These are STUNNING!! I love the green heart-makes the butterflies POP. The little colored in butterfly next to it is perfect. The wedding card is just so elegant and I love the way you used a monochromatic color scheme with this!! Boy that did happen fast. A challenge with hearts...er...I'll see if I have any (sputter, sputter). Seriously though, that wedding card is simply gorgeous...the heart looks embossed and that ribbon and it's meaning are so elegant. Beautifully done. Hope the Mister is pleased with this charming Valentine, I know I am and how clever of you to use patterned paper for the sweet butterfly. Your twofer really demonstrates just how different one heart can look! I love that your first card is die cut from all the same paper - a perfect look for a wedding card. What great symbolism with the ribbon and "tying the knot"! Your love note will make DH's heart flutter! He's a lucky man to receive such a gorgeous card! I love the fabulous paper on your butterfly and I actually think it fits in the design better without the dealybobs. Your green on white is a fantastic choice! Happy Twofer Day! Beautiful wedding card and I love the brilliant colors in the second card. Always think of heart cards in red/pinks but oh different thinking now. Beautiful cards, Darnell! Love that butterfly the best. Been out of town visiting my son, so I'm behind on commenting. Hope you're doing well! Your cards are equally amazing! I just missed the first challenge cut off because I procrastinated too long, something I will remedy immediately! Two beautiful cards - love the tone on tone of the wedding one and the non-traditional colours of the valentine one. Now to put my thinking cap on. Two very gorgeous cards. I especially love the wedding one and I like it all done with the neutral color too. Looks like another great challenge again. Two gorgeous cards, fun colour for the valentine card and love the simplicity of the wedding card. First of all I have to say that it is another dream shattered, just seen in your side bar that Hammy is imaginary, I won't sleep tonight now. Two lovely cards and two lovely hearts and design and love the colourful butterfly, but don't tell Mrs A I said that. That is a beautifully intricate heart die that looks as good in its all-together as it would with its pieces missing, Darnell. Changing out the ribbon would indeed personalize the wedding card. The bright colors on the valentine give a totally different feel which is the purpose isn't it. The Mister will love it. Beautiful cards Darnell. I didn't even guess the colorful butterfly was from the same die -- very clever use of that die IMHO. P.S. Congratulations on a Fabulous turn out for last months challenge, my friend. What a wonderful heart die, Dolly! I love how you kept all the pieces together so it looks like elegant embossing on the wedding card! The heart is very impressive in the bright green and the butterfly is gorgeous even without his dealie-bobber! I'll bet it brings a smile to Mister's face when he finds it! What an inspiration you are! I haven't yet made my mister a valentine, so I'm going to take a cue from you and get right on that. Love that linen cardstock. It looks so rich - like what you'd find on one of those $12 cards at the local boutique. Both cards are boutique-worthy, for sure!!! What a pretty pair of cards Darnell! I really like the green heart with the fancy colorful butterfly fluttering about! Hi Darnell! It is so lovely to visit you! Your work is always wonderful. I adore that heart die, which you have used to sweet perfection. The layering on the first is gorgeous and the pop of green on the second is dreamy! Thank you for the inspiration and thank you for visiting me recently. What a precious surprise. :) Have a sparkly rest of the weekend! oh my what gorgeous cards and their twofer designs are so beautiful. Love them both equally and that butterfly on the second is sooooooooooooooooooooooooooo! pretty. Two gorgeous cards as always ..... love the textured cardstock. 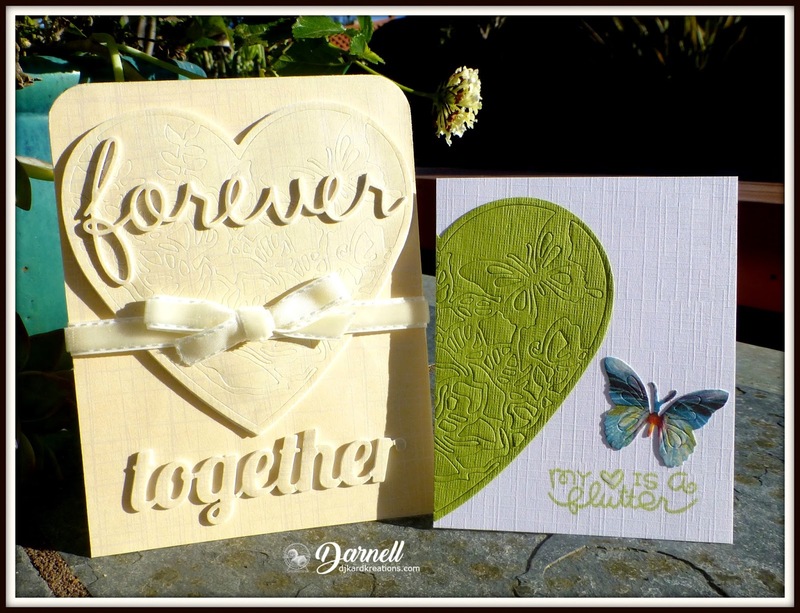 Two beautiful cards Darnell, I love the colours of the Valentine card and the gorgeous butterfly. ..... my brain doesn’t immediately grasp it..
mm, methinks I need to cogitate, ruminate, ponder, mull, meditate, munch thereupon!!! Mm, none the wiser, ...but may happen... like your hearts very much, very different and embossing a die iis didffernt!! .... I do have a couple of ideas but have some other “Must do’s” first, so time is limited.. we’ll see! Thanks for making us think outside the square, does us good! So pretty. Love both of your cards. Love the pretty heart you used on both cards and they look so different. Thanks for sharing. Both of these get a great big WOW!!! So beautiful and a wonderful way to use the heart. Love!!! Two stunning cards, love that one is going to be a love note to your hubby! If I slipped a note like that for hubby to find the inside would probably read something along the lines he's of "Don't forget to get some more milk!" Feel-a-vision! I would love that, but your photographs show the texture and dimension of both your cards beautifully. Love the linen paper and subtle color of your wedding card and, oh, that gorgeous velvet ribbon. I could have sworn the butterfly on #2 was one of those beautiful dimensional sticker elements. Wow! How amazing it looks cut from that paper! I'll put my thinking cap on and get ready for this challenge. Hearts are good for lots of occasions! Beautiful heart twofers, Darnell. The wedding card is so elegant... perfect for a wedding. And wonderful Valentine’s card... love the fact that you used non-traditional colours. Another fun challenge. Both your cards are beautiful Darnell! I'm sure I've got a few heart elements to choose from, many of which deserve to get used a bit more often, so I'll make an attempt to join in. Wonderful twofer inspiration card Darnell. The papers look so amazing and add fabulous texture. I'm looking forward to playing. WOW - what beautiful cards Darnell - love how you have used the hear die for your twofer. Your two cards are so very different, and stunning. I am sure Mr will love finding his. Hammy must be slipping on the job if he is not keeping you on focus!! Tut tut. Love both of these, Darnell! The elegant wedding card is just my style & great thought to use the bride's color choice for the ribbon to personalize it! The love note for your hubby is really fun--bet he loved finding it! That heart die is just amazing. It has such a lovely pattern. Your card bases are just beautiful - love the texture. How sweet that you tuck away cards for your hubby to find. Your twofers are spectacular. Two gorgeous cards, Darnell!...but my favorite is the white and green one. That butterfly is Gorgeous!!! I really like that big heart die too...don't think I've seen that before. Although, in all honesty, I haven't purchased any new stamps or dies in over a year, so I'm sure I'm way behind in all the new things that are out!! LOL!! Love the forever together sentiment. Thanks for your kind words last week on my blog. Wow - I love these. Both are BEAUTIFUL! Super elegant and so different. Awesome stuff! I particularly like your second card, I love the colour of the heart (vibrant green is always a favourite) and the very clever butterfly. It has recently dawned on me that offsetting a feature can be really effective, so despite my innate desire for symmetry, I have been trying to offset things on my cards recently, you have demonstrated that technique so well here. BEAUTIFUL Heart themed cards, Darnell! LOVE is in the February air and the recipients of these beauties are very lucky ducks. 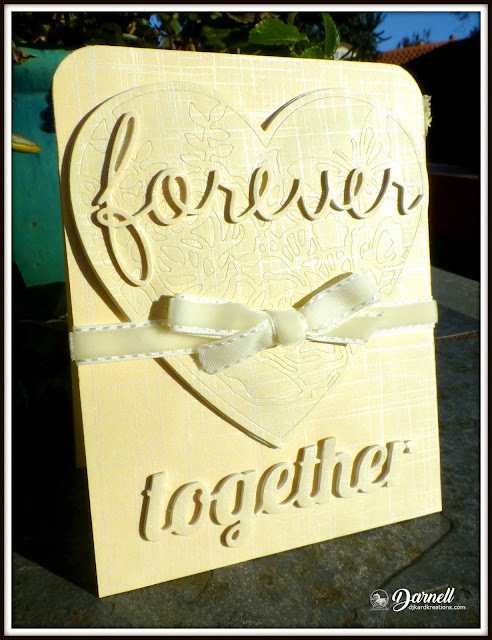 That embossed heart die is gorgeous~~as is your design! Two beautiful cards love the monochrome card and on the second card that beautiful butterfly, awesome. Love the challengeblog very much. It helps thinking out of the box and using your supplies in a different way. I have finally been able to plonk down at the laptop for a concerted effort at catching up. Beautiful cards but the raised sentiment on the wedding card is very eye catching. Hope the Mister realised that the card was from you lol!! !